This section contains all the dissemination and exploitation activities. They appear as sheets, including a full description of the activity and the audience it reached. The partners can insert new sheets. The fifth newsletter was sent to Inforef's relevant contact in Belgium and Europe. 150 people and organisations received it. The newsletter is available here. The UK Multiplier Event was held on 28th February 2018 as a showcase in a national event for providers of adult learning. A wide cross-section of organisations, including public sector organisations, VET training providers, vocational support agencies, regional colleges and universities, voluntary sector organisations attended. Approximately 400 people were registered for the event and 60 expressed an interest in coming to the CLIL showcase event.In the event 41 delegates attended. We also took advantage of the networking opportunities to broaden the reach of the projects’ results. Out of the 60 who had expressed an interest in the VG-CLIL Showcase, 41 attended the event which included presentations about the project and its objectives plus a demonstration of the Training Platform. Delegates were given the chance to experience the activities on the platform. On the 23rd February 2018 ASTERES organized the Italian multiplier event of the project. For the occasion we had the support of the Government of the Marche Region (Department for job policies and career guidance). The conference title was "Vocational and Career Guidance and ICT". During the day the project implementation and output were presented to a large audience of school leaders, teachers, career guidance operators, placement officers from the main Universities of the Region and citizens. The event was also the occasion to present the global policies of the regional Government in the field of vocational and career guidance, and to reflect on the possible integration between regional, national and European actions. Inforef is a partner in Noradica, an Erasmus+ project to promote interreligious dialogue and prevent the radicalisation of young people. The other partners are: Università degli Studi di Catania (applicant, Italy), Spoleczna Akademia Nauk (Poland), Inspectoratul scolar judetean Iasi (Romania), PMF SRL (Italy) and RenaSup (France). During the kick-off meeting organised by the Polish partner, Inforef presented "Vocational guidance in CLIL" to the project partners and distributed the project folders. “Demain je serai diplômé” was a thematic day organised by HELMo for its third baccalaureate (last year) students. It was an information day about entering the labour market, with sessions about such topics as writing a CV and entrepreneurship. INFOREF took the opportunity to introduce students to European mobility and the opportunities offered by ERASMUS+. The session was attended by HELMo 3rd BAC students and ERASMUS students spending the semester at HELMo. The session started with a presentation of the ERASMUS+ programme. People usually know about student mobility initiatives, but not all are aware of the other opportunities offered by the programme. INFOREF focussed its presentation on the first two key actions: Mobility, and Cooperation for innovation and good practices. This was followed by a presentation of Inforef’s activities, and particularly its ongoing educational projects, most of which are funded by ERASMUS+. Some time was also dedicated to science projects as most attendants studied laboratory techniques. The presentation with an introduction to “Vocational Guidance in CLIL”. The project was outlined: its objectives, target groups, partners, the main topics addressed in the training platform and how these were addressed. Then, the platform was shown, explaining how its section and it works, and showing a selection of videos from all five languages and examples of exercises based on them. The presentation finished showing what the platform looks like on a smartphone and displaying the links to it VGCLIL social networks. To conclude the session, Alice Cecchellero, an intern from Italy currently working in Belgium, told participants about her experience as an Erasmus student in Scotland and Spain and as a worker in Belgium. She explained what she had gained from those experiences, not only in terms of specific skills (languages, professional skills) but also soft skills and social interactions. She also explained how using the VGCLIL platform helped her improve her command of French. A multiplier event was organised by the UM team. There were more than 80 people initially enrolled but in the end 60 attended the event. There were four presentations on the project itself by the UM Coordinator of the project, the working opportunities abroad for Spanish graduates by the representative of the COIE, CLIL in professional contexts by Prof. P. Pérez-Paredes, and the Head of the Department of Relaciones Internacionales as a representative of the UM academic authorities. At the end there was a turn of interventions on the part of the participants and the discussion was very fruitful. Meeting at the French-speaking Belgian Agency, AEF-Europe to inform European roject applicants about the 2018 application. The VGCLIL project was presented to participants. Posting of Newsletter in BEST premises - up to 11,000 learners and up to 150 educators p.a. Several meeting were organized in order to let people know about the ME to be held on January 23rd and encourage people to participate in it. The fourth newsletter was sent to Inforef's relevant contact in Belgium and Europe. 150 people and organisations received it. The newsletter is available here. Meetings with the representatives of the COIE (Centro de Orientación e Información de Empleo) to discuss their participation in the Multiplier Event to be held on the 23rd of January. The Spanish version fo the fourth newsletter was widely distributed among students, professional associations, language centres, etc. Contact taken with HELMo (Haute Ecole Libre Mosane) to organise the final multiplier event and invite participants (teachers, future teachers, ERASMUS students). On 12th November 2017, Apricot held an event at their offices in Loughborough for the benefit of local companies who had expressed an interest in language learning for their employees. The event was well attended and the content, with its focus on employability, useful particularly for delegates with an HR remit. The employers who attended were encouraged to promote the project through their business networks. On the 9th and 10th November 2017, Professor Marianna Memè, on behalf of the cultural association ASTERES, the Italian partner of the project, presented the project's rationale, implementation and outputs at the international conference "ICT for Language Learning" in Florence at the presence of over 150 among university and college lectures, school teachers, representatives of European Agencies (including Nathalie Baidak from EACEA), private companies active in the field of e-learning, cultural associations members. The presentation rose a great interest among the audience and the opportunity of a follow-up received extremely positive comments. Apricot presented the training platform to key members of a large nationally funded Job Centre in Genova. The learning materials were then further disseminated at the bi-annual regional jobs fair run by the agency. The estimated audience was in the region of 300 delegates. These included employers, VET institutions, local and regional authorities as well as students and young job seekers. They were all encouraged to register on the platform, try out the learning modules and further promote the project through their own networks. During a regional meeting organized by the regional department for vocational guidance and job policies the project Vocational Guidance in CLIL has been presented to an audience made of counselors, vocational guidance experts, job centres operators. Europlan is an intensive training in European project management organised by Pixel Associazione in Florence. It is followed by a three-month internship in one European organisation. Most participants are adults between 20 and 30 with previous education; they come from all over Europe and sometimes beyond. The Skype meeting was meant to present to the students the organisations that agreed to receive interns, including Inforef. Inforef presented its activities and ongoing European projects, with special focus on "Vocational Guidance in CLIL" since Inforef is its coordinator and the platform is likely to interest those students, who seek international experience. Brochures had been previously provided to Pixel to be distributed to the participants (see event of the 19th-20th of October). 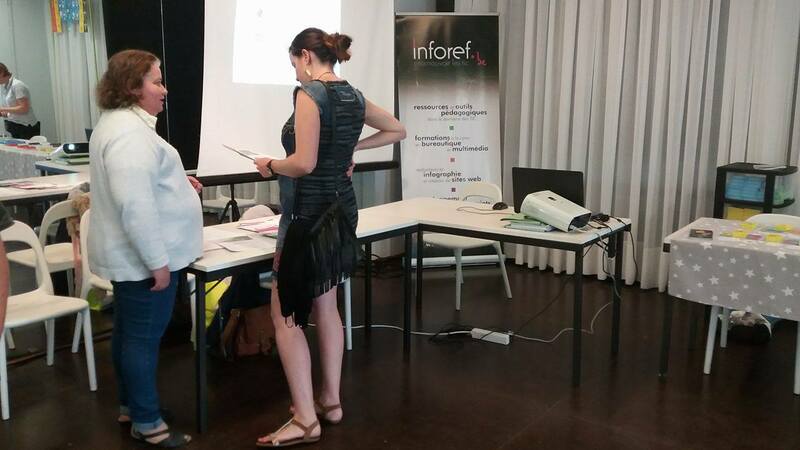 During the final multiplier event of the "E-Learning from Nature" project, Inforef's other ongoing projects, including "Vocational Guidance in CLIL", were briefly presented to an audience of teachers and students (future teachers). During a lesson within a course for unemployed funded by the European Social Fund (FSE), Dr. Ea Polonara explained the project and the relating training opportunities to the participants. "Salon de l'éducation" is an education faire held every year addressed to teachers. This 24th edition involved over 230 exhibitors and 200 conferences. More than 20,000 visitors attended. 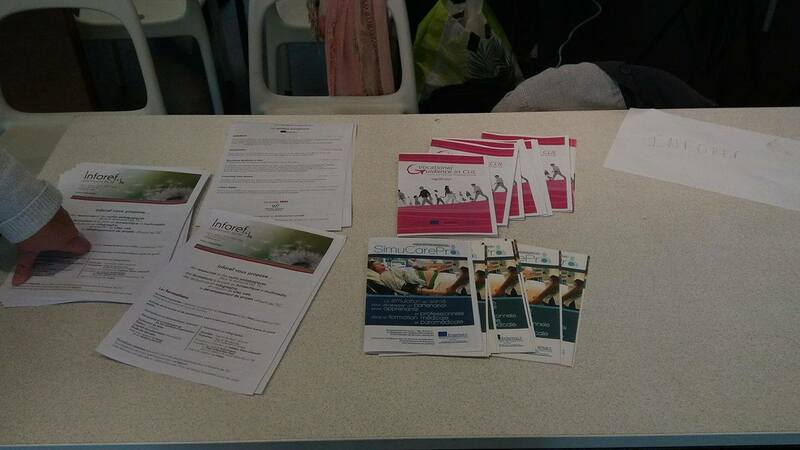 Inforef was there to inform visitors, mostly teachers, about the project and to distribute brochures. The "I Have Rights" European project has the objective to provide secondary school teachers with the skills to deal with multicultural classrooms through the acquisition of intercultural competences based on the understanding of human rights and non-discrimination values. During the third meeting, organised by Inforef, the VGCLIL project was presented to the partners: RENASUP (France - project promoter) Pixel Associazione (Italy - project coordinator), Siena University (Italy), Klaipeda University (Lithuania), Ius Gentium Conimbrigae (Portugal) and Aristotle University of Thessaloniki (Greece). Brochures were also given to Pixel to be distributed to the participants in their current Master in European project management. Participation in the fair "Reedukado" organised by Simila ASBL, addressed to teachers and other people who work with children and teenagers. The project activities were explained to participants and about fifty project flyers were handed out. During the third meeting in Limerick, Inforef presented VGCLIL to the project partners: Istituto F. Enriques (Italy), Pixel Associazione (Italy), Epimorfotiki Kilkis SM LLC (Greece), Limerick Institute of Technology (Ireland), Trakai Educational Assistance Authority (Lithuania), Instituto Politécnico de Bragança (Portugal) and Fundația EuroEd (Romania). Meeting of the board of directors of Inforef. They were presented the current project and activities of Inforef, including the "VGCLIL" project. Presentation of the project and distribution of brochures during the general assembly of CRIG (20 participants) CRIG is the research centre of the grouped institutes of HELMo (Haute Ecole Libre Mosane), which aims to coordinate the projects of the different categories of the college: technical, paramedical, social, pedagogical and economic categories. INFOREF is a member of the general assembly of CRIG and this meeting gave us the opportunity to present the project objectives during a workshop. The brochure distribution was an opportunity to explain the project activities and to seek the involvement of teachers, researchers and students of higher education. During the partner's meeting in Senigallia the project's consortium has been received by the Major and his collaborators, that asked for information about the project activities. This activity has been reported by the local online newspaper. Inforef attended the inauguration day at HELMo-Gramme, an engineering college. The project was mentioned to various people and brochures were attended. Further contact will be taken again by email with some people. Action Langues is a language centre for adults. The platform was shown to a group of adult immigrants who are learning French and searching employment in Belgium. The VGCLIL platform was presented to a group comprising 10 learners studying English as a second language at a local VET institution. They tried out a number of modules and found them useful as an aid to job searching. The materials also improved their 'functional' skills in English. The Sapienza University in Rome, the biggest Italian public University, published in its Facebook page the course Vocational Guidance in CLIL, offering the training opportunity to all its students. The Click lavoro portal published the course Vocational Guidance in CLIL in its Facebook page and website, offering this opportunity to all its followers. The Click lavoro portal is one of the biggest italian website for job search and it is visited every day by thousends of people looking for a job and used by many employment agencies. The Informagiovani Agency of Alessandria published the course Vocational Guidance in CLIL in its Facebook page and website, offering this opportunity to all its followers. The Informagiovani network is present in every Italian region and supports students and young workers in their academic, professional and cultural development. The Alessandria's agency has a network of followers and affiliated associations active in northern Italy. On the 20/06/2017, the project “Vocational Guidance in CLIL” has been presented in Senigallia at “Caffè delle Lingue”. This is a group of people that meet on a weekly base to practice the speaking of foreign languages. They meet in a cafeteria in Senigallia and, with the help of native speakers, have a chat in a language of their choice (English, Spanish, French or German). The typical participants to this initiative are young workers who needs to develop language skills, or students thinking about an experience abroad. We presented the training opportunity created by VGCLIL partnership, and some of them have already subscribed to the e-course. Presentation of "Vocational Guidance in CLIL" at the 16 International AELFE conference "LSP in multi-disciplinary contexts of teaching and research" in Merida (Spain) 16 June 2017. Inforef was invited by the French-speaking Belgian National Agency (AEF-Europe) to present the VGCLIL website to other European project managers. The focus was on the management and dissemination sections, as many project coordinators do not know how to collect their partners dissemination activities. About forty people attended. Tweets updating audience on progress of the training platform and promoting participation in pilot phase. Several links to the online platform were tweeted. They were retweeted by Erasmus+ (over 2000 followers) and several other profiles related to employment. The e-course was published by the Eures Agency of the province of Ancona, which counts on thousands of followers among people looking for job experiences abroad, employment centres, associations and local insititutions. The e-course was published by the Eures Agency of the province of Macerata, which counts on thousands of followers among people looking for job experiences abroad, employment centres, associations and local insititutions. The e-course was published by the Eures Agency of the province of Ascoli Piceno, which counts on thousands of followers among people looking for job experiences abroad, employment centres, associations and local insititutions. The platform and the e-course was presented at the "Consulta della cultura" meeting, at the presence of the Responsible for cultural activities of Senigallia's Council, Mrs Simonetta Bucari, and of the representatives of all the cultural associations of the town. We also gave a dimonstration of the use of the platform. On Tuesday May 23rd Dr Ea Polonara had the oportunity to meet Dr Alessandra Cerioni, responsible for all EURES agencies of the Marche Region. The project and the e-course was explained to her, in order to be then disseminated to all the Eures regional network. The third newsletter was sent to ASTERES's relevant contact in Italy and Europe. 200 people and organisations received it. The project and the e-course has been presented to the Eures representative for the Marche region. The link for accessing the platform and information about the project will be published on Eures website (accessed at national level) and all the users visiting Eures offices in the region will be informed about the opportunities offered by it. The latest newsletter was distributed to 78 institutions with an estimated audience of over 150. We received feedback from 2 language centres that inquired as to the feasibility of using the CLIL resources with their migrant students. We are currently assessing their language levels to see if they reach the required level to benefit from B2 materials. The third newsletter was sent to Inforef's relevant contact in Belgium and Europe. 152 people and organisations received it. The newsletter is available here. The project was presented at a conference in Meppel, Netherlands to an international audience comprising 35 delegates. Flyers were distributed in addition to a short presentation on the purpose of the CLIL project and a description plus samples of the materials and resources imminently available in 5 languages. On friday 28th April an important event took place at "La Fenice" Theatre in Senigallia. The Committees of all the associations of the town (Culture, Sport, Youth, Migration, International exchange and twinnings) met up together in order to present their most interesting activities. ASTERES took part in the event, and we had the opportunity to distribute the project flyers and relevant information to many young workers interested in working abroad. On the 11th April 2017 the project “Vocational Guidance in CLIL” was presented during a meeting of the Culture Associations Committee in Senigallia. The Committee in composed of 94 associations of the town, active in the fields of culture and active citizenship. During the presentation, the training opportunity offered by the project was explained and advertised. Furthermore we offered the representatives of the associations the chance to collaborate with ASTERES for the organization of an event inspired to the theme of the European citizenship, to complement the project’s final conference foreseen in February 2018. On the 5th April 2017 the project "Vocational Guidance in CLIL" was presented to the local Employment Centre and the Eures local centre. The aims and the output of the project have been explained to the responsible of the centre that support and train the unemployed of all the aerea (Including not only Senigallia, but also 5 smaller towns, for a total amount of 60.000 users). Furthermore the Centre hosts the local Eures Centre, that from today will start distributing the projects materials and proposing the e-course to all those interested in working in another European country. During the second meeting, the VGCLIL project was presented to the partners: RENASUP (France - project promoter) Pixel Associazione (Italy - project coordinator), Siena University (Italy), Klaipeda University (Lithuania), Ius Gentium Conimbrigae (Portugal) and Aristotle University of Thessaloniki (Greece). Inforef created the Twitter account for the VGCLIL project and platform. All partners have received the logi and password and can use it to disseminate the project, in particular to attract possible pilot users. The project was presented at a convention of employability trainers held at 2 local Colleges of further education. One of these events was held on Thursday 2nd March a.m. and repeated at the 2nd venue in the afternoon of the same day. Both events were well attended by trainers, representatives from local authorities and 9 local companies. 3 of the attendees (trainers) expressed an interest in piloting the modules in Italian and one company expressed an interest in piloting the Spanish resources. Several meetings with the Director and teachers of the SIDI, Language Centre of the University of Murcia to let her know about the project and the piloting of the materials produced by the partners in English, Italian, French and German. The second newsletter was sent to Inforef's relevant contact in Belgium and Europe. 156 people and organisations received it. The newsletter is available here. Our newsletter reaches all our European Erasmus+ partners, who operate in the field of Education, Training, Inclusion, Employability. At local level our contacts are mainly local authorities, schools, companies and associations. This event focused on Learning Networks (discussion groups for organisations funded through Erasmus+).The meeting provided an excellent opportunity to exchange ideas and project information with a number of key stakeholders as well as peers.Apricot attended and contributed to a workshop focused on employability where the VGCLIL project was discussed in some detail.A number of project managers were enthusiastic about the concept, especially with respect to mobility projects and there were fruitful discussions on synergy and complementarity.Useful contacts were also established with language centres trainers who had previous experience of developing and delivering CLIL materials. Meeting with people of the Centro de Orientación e Información de Empleo of Murcia University to let them know about the project. "Not Only Fair Play" is an Erasmus+ project aiming to support athlete students and to promote sport at school and an ethical practice of sports among students. It gathers eleven partners from Belgium (Inforef), Italy (including the coordinator), Bulgaria, Finland, France, Poland, Romania,Turkey and United Kingdom. During the final partners' meeting organised by the promoter Datini, Inforef presented the project to the partners. During the second meeting in Liège, Inforef presented VGCLIL to the project partners: Istituto F. Enriques (Italy), Pixel Associazione (Italy), Epimorfotiki Kilkis SM LLC (Greece), Limerick Institute of Technology (Ireland), Trakai Educational Assistance Authority (Lithuania), Instituto Politécnico de Bragança (Portugal) and Fundația EuroEd (Romania). Monday 24th October 2016 Dr. Ea Polonara, on behalf of the association ASTERES, had the pleasure to take part in an event organised by Senigallia’s Rotary Club. The event was dedicated to all those students and young workers who are wishing to experience studying and/or working abroad. Local politicians, School leaders, job policies experts discussed about how to create more opportunity to foster the free mobility of students and workers within the EU. During the event many youngsters had the opportunity to talk about their experience abroad. The project VGCLIL was presented and raised a remarkable interest among the 60 stakeholders. During the kick-off meeting, the VGCLIL project was presented to the partners: RENASUP (France - project promoter) Pixel Associazione (Italy - project coordinator), Siena University (Italy), Klaipeda University (Lithuania), Ius Gentium Conimbrigae (Portugal) and Aristotle University of Thessaloniki (Greece). The SimuCarePro project is funded by the European Commission and the Belgium National Agency for the Erasmus+ . During the second meeting in September 2016 in Paris, Inforef presented "VGCLIL" to the project partners. In September 2016, the language center « Action Langues Verviers » (http://www.vervierslangues.be/) started to experiment the first exercises in French with a group of learners (young and adult immigrants living in Belgium). The feedback from these “end users” will be very useful to adapt accurately the content and the language level of the exercises. School&Work is an Erasmus+ project aiming to promote synergies between school education and the labour market. During the fourth transnational meeting, Inforef presented its projects, including VGCLIL, to the project partners. Brochures were distributed among the attendants to the XV International Conference of AELFE, held at the University of Alcalá de Henarés (Spain). Meeting with a member of "Action Langues Verviers". 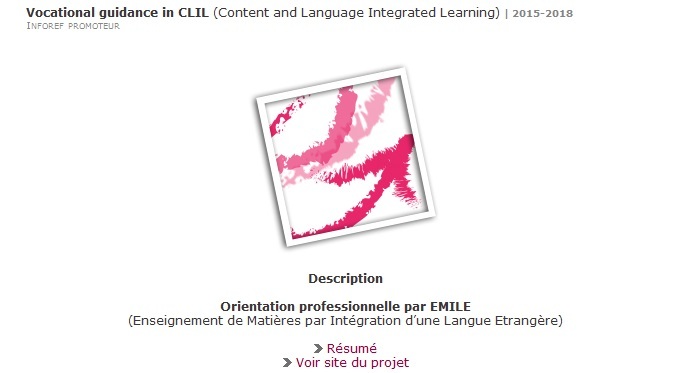 The project was presented and the first draft of the production of CLIL exercises template was shown. Inforef and ALV discussed the project activities and future cooperation. Final conference of the Erasmus+ project "School&Work", dedicated to vocational guidance. Inforef presented its other projects, including VGCLIL. Conference on Bullying, as part of the "Sonet-Bull" project. Information about VGCLIL were available for the participants. The project was presented at a careers open day where local colleges were recruiting young people and adults on full and part time vocational courses for the next academic year. Apricot participated in the programme and took the opportunity to promote the benefits of CLIL to prospective students especially those with an interest in languages and EU internships. There were also a number of adult job seekers who expressed interest in the CLIL approach and would be keen to pilot the new learning materials. Apricot was asked to present the project at a local VET institution interested in using the CLIL methodology to improve the career prospects of adult job seekers wishing to improve their language skills in order to work in other EU countries. SONET-Bull is an Erasmus+ project that aims to use ICT social networking tools with peer learning and crowdsourcing to train school communities to counter student bullying. The fourth partners' meeting took place in Rome and gathered partners from Greece ("Hellenic Open University" and "Computer Technology Institute and Press"), Ireland (Dublin City University) and Italy (Fondazione Mondo Digitale). Inforef presented "VGCLIL" to the partners. The Newsletter has been sent to the Internacional Association AESLA to be distributed among its members. "Not Only Fair Play" is an Erasmus+ project aiming to support athlete students and to promote sport at school and an ethical practice of sports among students. It gathers eleven partners from Belgium (Inforef), Italy (including the coordinator), Bulgaria, Finland, France, Poland, Romania,Turkey and United Kingdom. During the third parrtners' meeting organised by the Finnish partner OMNIA, Inforef presented the project to the partners. V.I.S.I.ON is an Erasmus+ project that aims to create a website intended for the training of people with visual impairment through theatre and artistic activities. The project is coordinated by the Foundation for development of the cultural and business potential of civil society (FDCBPCS) in Sofia (Bulgaria). Inforef is the technical partner and the other proejct partners are Nadezhda za vsichki (Bulgaria), School for visually impaired children “Louis Braille“ (Bulgaria), Music’Arte (Italy), I Bohemiens (Italy), Dante Alighieri Society (Luxemburg) and UCAN /Unique Creative Arts Network (United Kingdom). During the fifth meeting, Inforef presented its recent and current projects, including "VGCLIL". SIEP is a fair dedicated to education and career guidance. Dozens of stands of schools, colleges, training centres and public services are there to inform students about studies and careers. Hundreds of teachers, students and parents visit or attend it. Inforef had a stand to present its activities. Project folders were distributed and school stands were visited to try to involve new schools. The first newsletter was sent to Inforef's relevant contact in Belgium and Europe. 171 people and organisations received it. posting of Newsletter in premises, up to 13.000 learners and up to 150 educators p.a. During the third transnational meeting, Inforef presented its projects, including VGCLIL, to the project partners. V.I.S.I.ON is an Erasmus+ project that aims to create a website intended for the training of people with visual impairment through theatre and artistic activities. The project is coordinated by the Foundation for development of the cultural and business potential of civil society (FDCBPCS) in Sofia (Bulgaria). Inforef is the technical partner and the other proejct partners are Nadezhda za vsichki (Bulgaria), School for visually impaired children “Louis Braille“ (Bulgaria), Music’Arte (Italy), I Bohemiens (Italy), Dante Alighieri Society (Luxemburg) and UCAN /Unique Creative Arts Network (United Kingdom). During the fourth meeting, Inforef presented its recent and current projects, including "VGCLIL". During the kick-off meeting in Florence, Inforef presented VGCLIL to the project partners: Istituto F. Enriques (Italy), Pixel Associazione (Italy), Epimorfotiki Kilkis SM LLC (Greece), Limerick Institute of Technology (Ireland), Trakai Educational Assistance Authority (Lithuania), Instituto Politécnico de Bragança (Portugal) and Fundația EuroEd (Romania). In January 2016 the project was presented to the virtual community of the e-learning course “Techno CLIL for EVO 2016”. This course aims at spreading CLIL methodology, combining teaching strategies and technical tools and eliciting reflections and discussions among teachers from all over the world. The project objectives and expected results have been shared in the platform forum, and raised a great interest among the over 5000 participants. The SIMUCARE project is funded by the European Commission and the Belgium National Agency for the Erasmus+ . During the kick-off meeting in november 2015 in Belgium Inforef presented "VGCLIL" to the project partners. SONET-Bull is an Erasmus+ project that aims to use ICT social networking tools with peer learning and crowdsourcing to train school communities to counter student bullying. The third partners' meeting took place in Dublin and gathered partners from Greece ("Hellenic Open University" and "Computer Technology Institute and Press"), Ireland (Dublin City University) and Italy (Fondazione Mondo Digitale). Inforef presented "VGCLIL" to the partners. V.I.S.I.ON is an Earsmus+ project thaim aims to creat a website intended for the training of people with visual impairment through theatre and artistic activities. The project is coordinated by the Foundation for development of the cultural and business potential of civil society (FDCBPCS) in Sofia (Bulgaria). Inforef is the technical partner and the other proejct partners are Nadezhda za vsichki (Bulgaria), School for visually impaired children “Louis Braille“ (Bulgaria), Music’Arte (Italy), I Bohemiens (Italy), Dante Alighieri Society (Luxemburg) and UCAN /Unique Creative Arts Network (United Kingdom). During the third meeting, Inforef presented its recent and current projects, including "VGCLIL". The aims and objectives and progress to date were presented at an international meeting. ASTERES is member of Senigallia’s Council of Culture, that gathers more than 90 City Associations active in the field of culture. During the last Council meetings the project’s staff had the opportunity to present the project to all the members. The project was presented at an exhibition for local employers. Publication of the project summary in the three-monthly information report (p. 16) (July - August - September 2015 issue) of AEDE-EL (European Association of Teachers - Catholic education - French-speaking Belgium) : Report no 3. Information about the project development are being constantly issued by ASTERES through its website and Social Media profiles. The project was presented during the development of a Training Course for Vocational Guidance Trainers and operators called “Formaorienta”. The course was organized by the local government of Le Marche Regionand involved 250 participants that have been informed about the project and the expected outputs and impact by Prof. Ea Polonara, which was one of the trainers and which is part of the project’s team in Italy. Furthermore the seminars were carried out in 10 different cities of the region, ensuring a vast diffusion of the information within the regional area.